Welcome to our review of the Leapers UTG 4×32 Crossbow Scope. I’d never worked with a Leapers scope before, but I couldn’t pass up the low price of the glass. I’ve put this crossbow scope through its paces, so let’s see how well it stacks up to the competition. What Are the Dimensions of the Leapers Crossbow Scope? This crossbow scope weighs in at just 12.3 ounces, and is 8.19 inches long. The tube is the standard 1 inch fare, with a total width of 1.65 inches at the sunshade end of the scope. The objective lens is a 32mm piece of glass. In other words, this particular crossbow scope should fit perfectly on any x-bow with a Weaver or Picatinny rail. Eye relief on the Leapers 4×32 scope is a very generous and comfortable 3.8 inches, so there’s plenty of space between you and the scope when you’re shooting. The scope is designed to be parallax-free up to 50 yards, which is plenty of range for crossbow hunting. 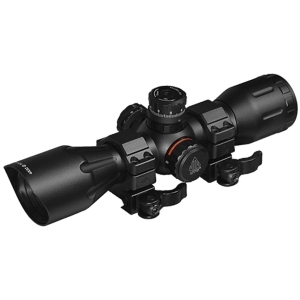 This scope features a 32mm objective lens, and offers fixed magnification at 4X. The resolution and clarity is excellent, especially considering the rock-bottom price of the scope, even allowing you to count the points on that buck from 50 yards away. Leapers doesn’t specify whether the optics on this scope are multi-coated or fully multi-coated; the manufacturer just says that it uses “broadband lens coating.” Given the light transmission of the scope, though, I’m leaning towards thinking the optics are fully multi-coated, but don’t quote me on that. The only complaint I have about this scope lies in the reticle. Having all five lines crossing the diameter of the eyepiece is a bit overkill, and gets in the way of a good view through the scope. I would have liked to see a pyramid-style reticle on this scope instead. Leapers has designed this scope to offer excellent light transmission for a 32mm objective lens. The view in low-light conditions is nothing short of amazing, and the illuminated reticle is designed with perfect brightness settings. The illumination is configurable to either red or green, with five brightness settings of each color. You can also turn the illumination completely off for a black reticle, perfect for daytime use. The scope requires a CR1620 battery, and one is included in the box. Be sure to pick up a spare or two if you do a lot of low-light hunting. The scope offers great battery life, but cold weather has a really bad effect on batteries, no matter how economical the scope is with its power consumption. During one particular early morning, I peered through this scope at a 12-point buck. The light transmission, coupled with the clarity and resolution of the scope, let me even see the beast’s chest move as he breathed. The Leapers scope provided an excellent bead on the deer, allowing me a clean shot that the buck could only stagger a few yards away from before he took his dirt nap. The field of view on this scope is fantastic, giving you 27.2 feet of viewable terrain at 100 yards. This is more than enough to acquire your target and get set up for that perfect shot. Mounting the Leapers UTG 4×32 scope is quite simple, as long as you follow the right procedure to do it. The scope comes with the rings you need, so as long as your crossbow has a standard Weaver or Picatinny rail, you’ll be in easy business. Just light mounting the scope, sighting in is all about following the right procedure. I’ve heard of people having problems sighting in the Leapers UTG 4×32 scope, but once I’d given them my “secret formula,” they were in business within minutes. The windage and elevation turrets feature a locking ring to lock zero, as well as a zero-reset function to align the markings after zeroing your scope. Once you’ve got this baby sighted in, there’s almost nothing that can knock it off short of using the scope on something with recoil. The Leapers UTG 4×32 crossbow scope is built on the manufacturer’s True Strength scope platform, providing you with a scope that is nitrogen-purged to make it fogproof, and it’s also rainproof and shockproof. I’ve dropped this scope out of the tree stand several times without damage or knocking the sight out of alignment. The only complaint I’ve heard is that the odd scope comes from Leapers dead on arrival. I’ve only seen this in two out of a hundred cases, but it’s still worth mentioning. Leapers has pulled off the unthinkable with the UTG 4×32 crossbow scope. It’s brought professional-grade optics to the budget-friendly price range. This is an excellent scope, worth much more than the going price. Leapers has pulled off the unthinkable with the UTG 4x32 crossbow scope. It’s brought professional-grade optics to the budget-friendly price range. This is an excellent scope, worth much more than the going price.